SRAM Road Garmin GPS/Computer Mount, 31.8mm, Quarter Turn/Twist Lock. SRAM delivers an uncomplicated computer mount thats easy to install, lightweight, and above all, vibration and slip-free. At only 20g, with a single torx T25 bolt, flexible mounting clasp, and a 1/4 twist mount, it installs quickly, simply and securely on any 31.8mm bar surface. 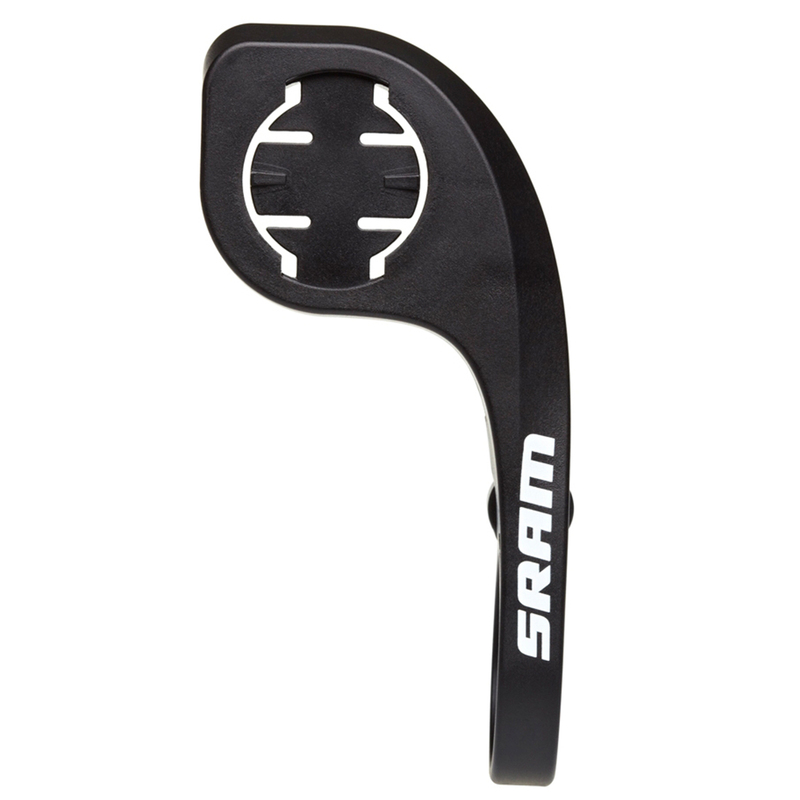 The SRAM QuickView Computer Mount also features a center-offset design so the computer can be placed directly in front of the stem, or flip it to position the computer before the bar for MTB or CycloCross use. Good value garmin mount. Bought the first one 3 yrs ago and its still going strong. Okay but not as good as gramin version as it is not dropped so level of garmin unit sticks up above stem. Really good product and really cheap. Looks the business, holds tight and easy to install. Bought for my road bike, very easy to fit and is a secure mount for my Garmin 500 (more so than the Garmin mount). Check size of your handlebar as the oversize version I ordered does not have 'adapters' to fit smaller diameter bars. Good product which for my purposes I cannot fault and price is comparable with other handlebar mounts , hence 5 stars. Great product, much easier to see computer. Would recommend, Merlin great price also. Works well for the money. Durable. My second one of these, one on each bike. Secure & stable & half the price of the Garmin one. Well made and cheaper price than the Garmin product. Flawless! A very sturdy out front 1/4 turn mount at half the price of the Garmin one. What's not to like? Perfect. Exactly what I needed to put my Bryton GPS where I could read it without looking too far away from the road. Seems well made and GPS not moving around when hitting potholes. As usual with Merlin arrived quickly. Makes your device easier to see when on the move. Bought for my son. It was easy to fit, and seems more robust than the Garmin original. Excellent, well made mount. It has a moulded-in metal thread that allows you to tighten it up well, as on other mounts I have found that the Garmin GPS unit can slip slightly. Makes the Garmin screen much easier to read. Easy to fit and holds the unit in place very securely. Still quite pricey for a small piece of plastic but much cheaper than the Garmin equivalent product. Sram Garmin mounts are spot on, make reading the head unit much easier than on bar stem, wish I'd got one years ago. Great item, fits on handlebars well and puts garmin in the perfect position without you having to tuck your chin right into your chest. Was easy to fit and feels very sturdy. Garmin fits in easily as well. I recommend it on a road bike. Very well constructed, very stylish. Mounting screw clever in that it makes it difficult to quickly remove by a thief. Seems a lot of money for a bit of plastic, having said that it's really solid and looks good, giving confidence when mounting device. Be aware the bolt head needs a star key to tighten. Great price, why pay more...and it fits my Bryton snug as a bug. Much better than the garmin mount as this holds my garmin 800 level rather than it being a couple of degrees out as with the garmin mount. I don't have OCD but this still really annoyed me. At around 50% of the cost of the garmin equivalent! you can't go wrong. Best value mount around. Simple to fit (with torx T25 bolt) and makes reading & using Edge 500 much easier. Easy to fit to bars and a secure fitting for my Garmin. Very good value compared to alternatives but time will tell if it has the longevity. Fast delivery from Merlin as always. If you have a Garmin 500 or 800 series computer then I wholeheartedly recommend buying this mount. It is much more secure than the mount supplied with the Garmin and also puts the display in front of the bars where it is far easier to read. Great price and super fast delivery from Merlin too! Great bit of kit to bring your Garmin into your line of sight, much cheaper than the garmin offering too. Also, super fast service and great prices from Merlin. Excellent product, looks neat with no bolts showing, is sturdy and holds garmin securely with no shaking. Excellent service from merlin once again with item arriving promptly. Great product. Easy to fit and securely holds my garmin edge in place. Enables garmin to be place centrally in front of bars, which aids visibility. Cheaper than garmin mount. Works well, simple to fit, good value and it holds the Garmin straight which is more than the Garmin Out Front mount does!!! Service from Merlin, Great as usual!!! A great bit of kit at a sensible price that does exactly what you want. The only way I would improve it would be to have the garmin sit a little lower infront of the stem.